The development of the nephron is piloted by interactions between epithelial and surrounding mesenchymal stem/progenitor cells. Data show that an astonishingly wide interstitial space separates both kinds of stem/progenitor cells. A simple contrasting procedure was applied to visualize features that keep renal epithelial and mesenchymal stem/progenitor cells in distance. The kidney of neonatal rabbits was fixed in solutions containing glutaraldehyde (GA) in combination with alcian blue, lanthanum, ruthenium red, or tannic acid. To obtain a comparable view to the renal stem/progenitor cell niche, the tissue was exactly orientated along the axis of collecting ducts. Fixation with GA or in combination with alcian blue or lanthanum revealed an inconspicuous interstitial space. In contrast, fixation with GA containing ruthenium red exhibits strands of extracellular matrix lining from epithelial stem/progenitor cells through the interstitium up to the surface of mesenchymal stem/progenitor cells. Fixation with GA containing tannic acid shows that the basal lamina of epithelial stem/progenitor cells, the adjacent interstitial space and also the surface of mesenchymal stem/progenitor cells are connected over a net of extracellular matrix. 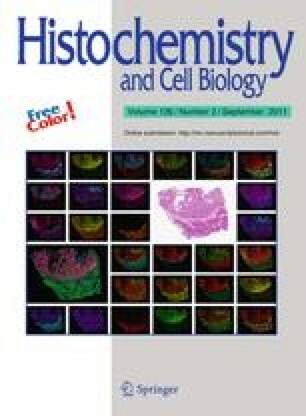 The applied technique appears to be a suitable method to illuminate the interstitium in stem/progenitor cell niches of specialized tissues, the microenvironment of tumors and extension of degeneration.